On Veður, you can change the language to English at the top of the home page. Select the "Weather" tab (top left). 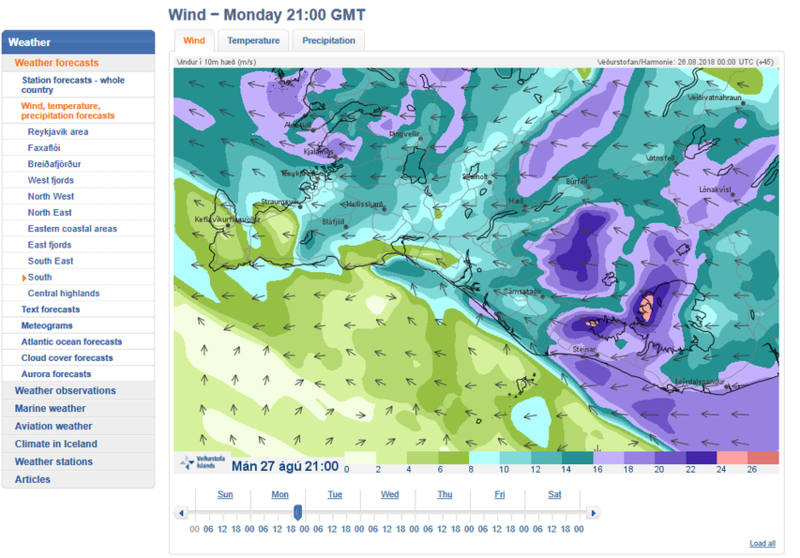 Select "Wind, temperature, precipitation forecasts" from the left side bar. Click through hourly predictions with the arrows at the bottom. To locate the Laugavegur hiking trail, see the red line I have drawn on the example map below. Anything green (0-8 meters per second) is totally fine. The lightest blue (8-10 mps) is getting to be a little windy, but still manageable for most people and tents. At 10-12 mps, poor quality or badly erected/secured tents will begin to have problems. 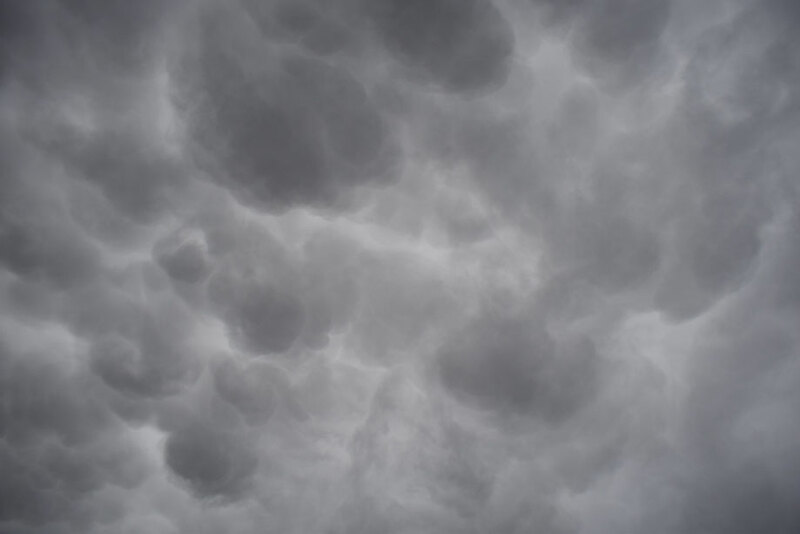 In combination with rain, hiking conditions will be unpleasant for most people. 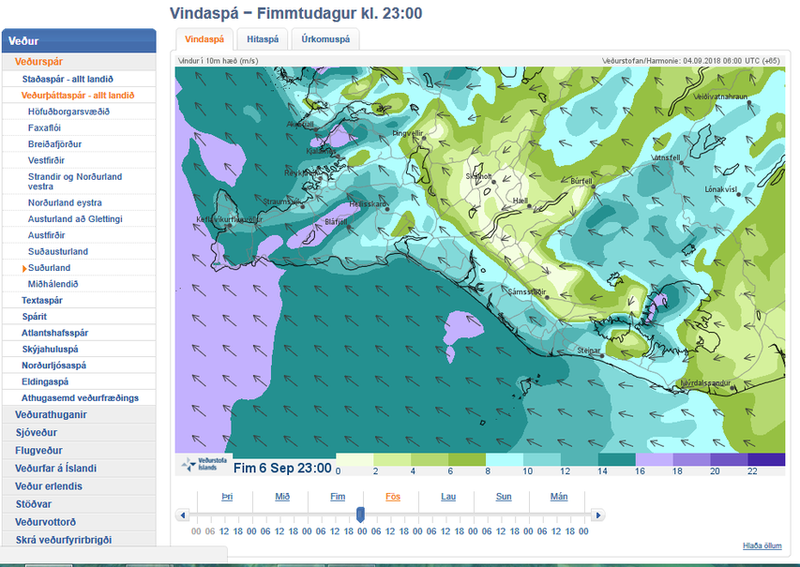 If the wardens see darker blue (12-16 mps) near the Laugavegur, they are likely to tell you not to camp at Hrafntinnusker or Álftavatn (Landmannalaugar will also be bad in a tent, but there is a little more infrastructure and bus departures each day). You might need to wait one night in Landmannalaugar and begin early morning to Hvanngil. In combination with rain, with snow on the ground or poor visibility, these conditions can be dangerous for hiking and you will need a GPS device. 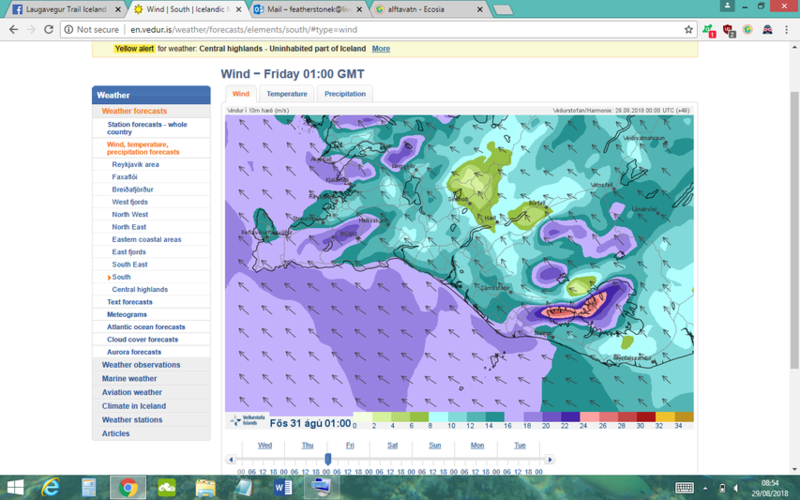 Anything in the purple range or above is likely to destroy the majority of tents and be very challenging to walk in. 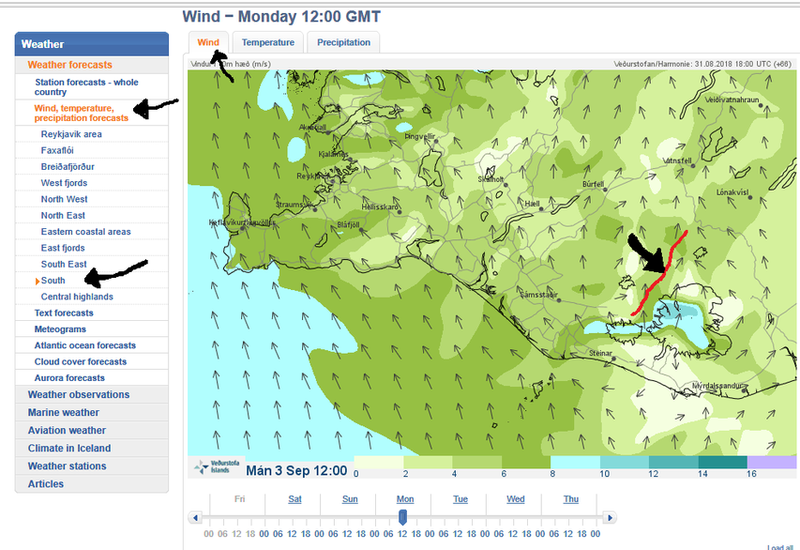 When observing the wind direction, remember that wind coming from the south will be in your face. Please note "yellow alert" at the top of the page below. Hikers, people on bicycles, horses or those staying in tents were advised seek shelter in these conditions. 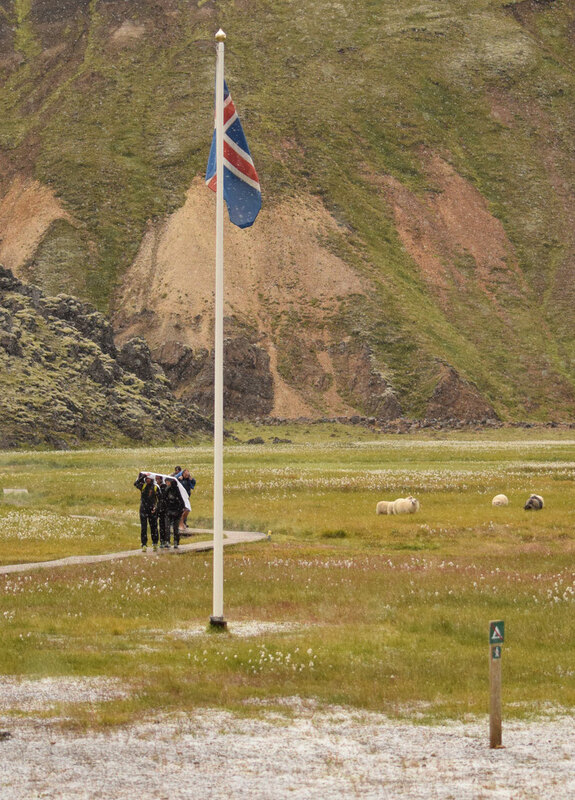 The photo below was taken at Landmannalaugar around the time of the weather prediction just above (27/08/18). Most tents could not be put up, were deconstructed by their owners or just destroyed. 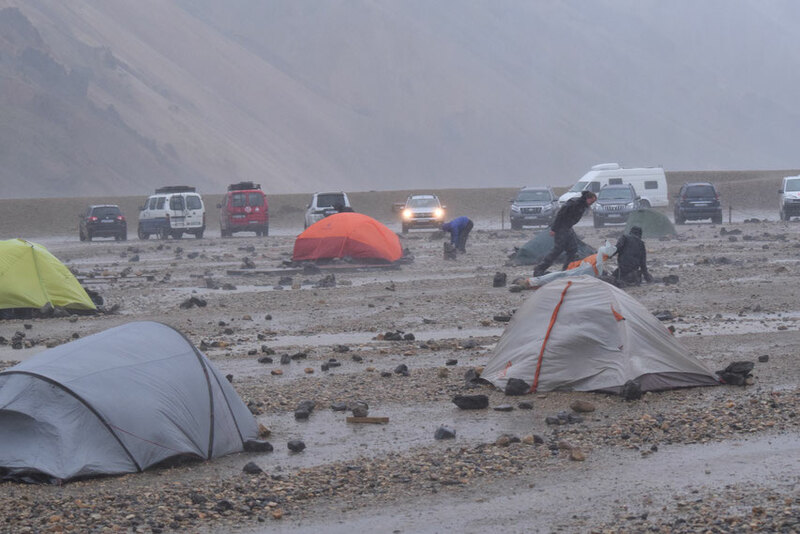 Everyone was advised not to hike in anticipation of this weather and campers who reached Hrafntinnusker (having not asked advice before leaving) were turned back to Landmannalaugar before the storm hit for safety reasons. How you cope with rain depends on the quality or your equipment, your attitude and whether you stay in a tent or a hut (and have the opportunity to dry things). Waterproof jackets, trousers and boots are obviously essential, but you also need to be sure that the contents of your backpack is also fully waterproof (bag cover and also dry bags/bin bags to protect things inside). In low visibility, you might need a GPS device. 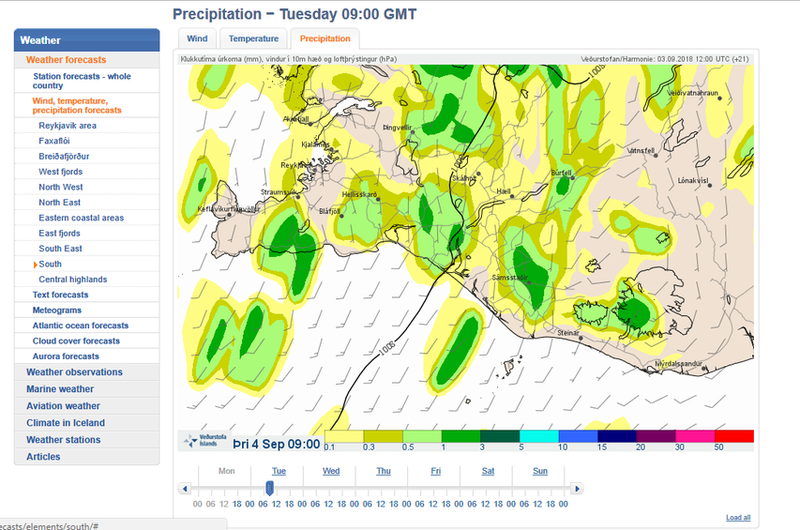 To study the rain forecast, click through each day, hour by hour. It is very unusual for a whole day to pass without any rain. 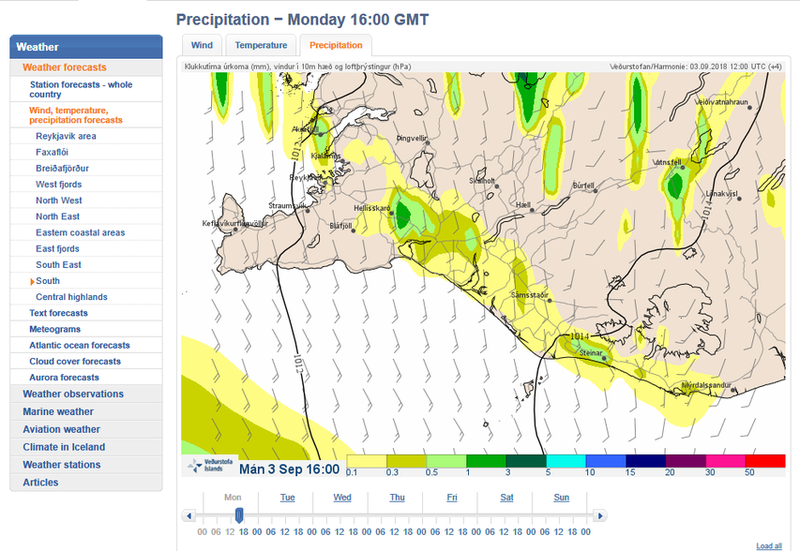 Light precipitation of 0.1 mm/hour (light yellow) and anything up to 1 mm/hour (lightest green) is totally normal. You should be prepared to walk in this a lot of the time. Bright green (1-3 mm/hour) is heavy rain. This can be manageable for a short period of time, but difficult for hikers if it continues for many hours/days. Anything above 3 mm/hour (dark green) will soak through all but the very best equipment. 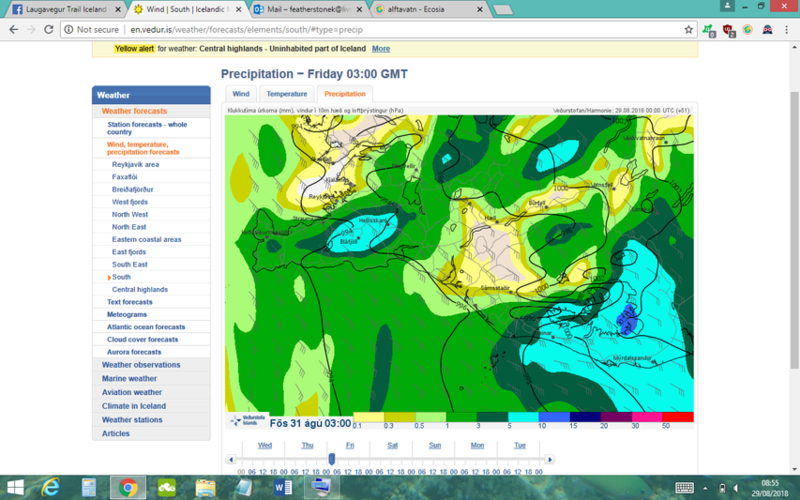 5 mm/hour is extremely heavy rain. 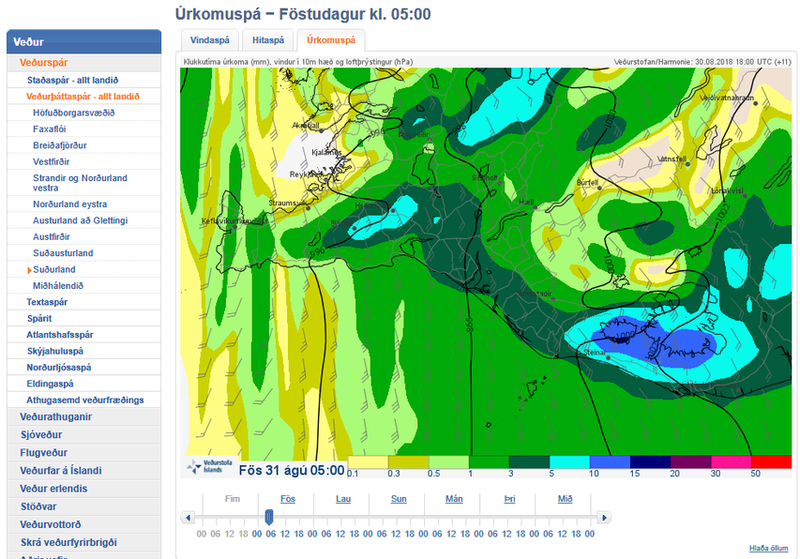 If I saw this forecast I would check carefully hour by hour to see how long this rain will stick around and if it is likely to be heavy on the Laugavegur. I would also refer to Belgingur (see below). 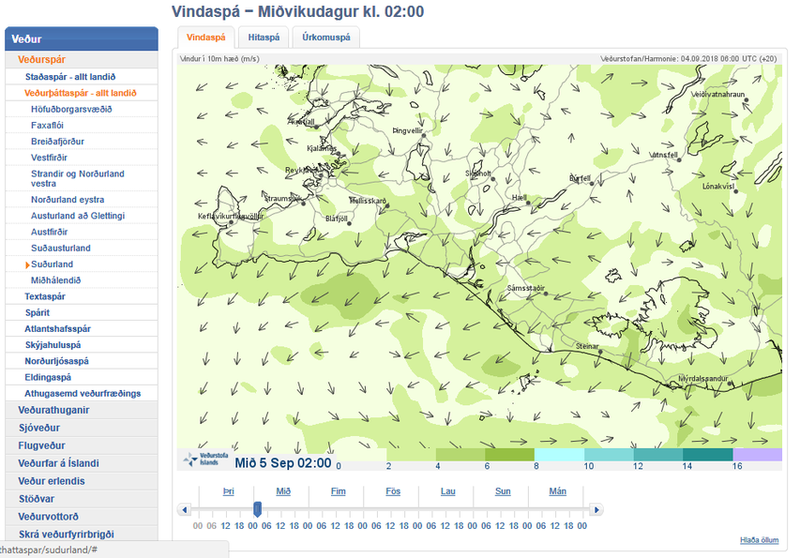 Belgingur usually have more accurate wind-speed estimates for Hrafntinnusker. Select both "precipitation and wind". Use the arrow on the bottom right to play and pause the three day weather forecast. 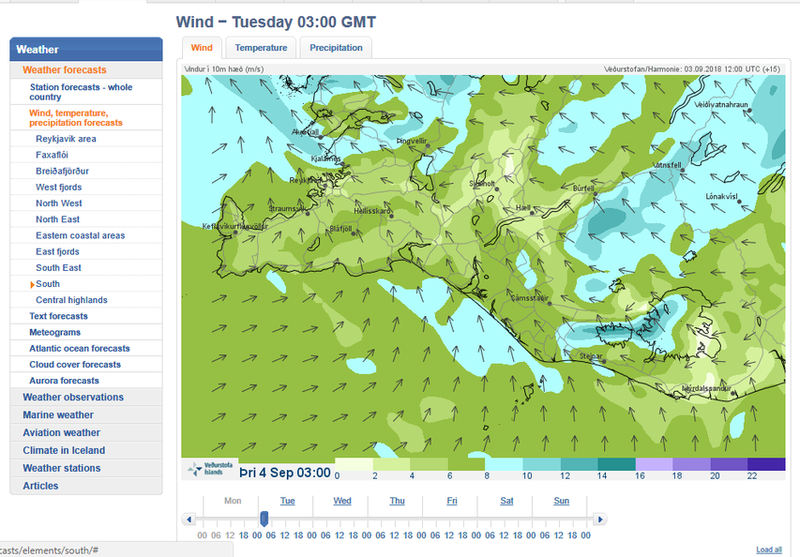 Wind speed (small numbers on the map). 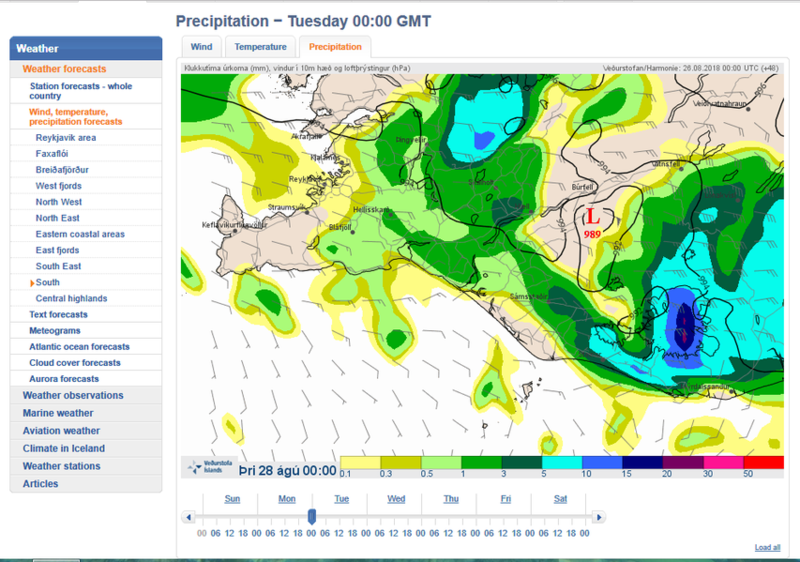 Amount of rain (colours according to the scale shown at the top of the page). 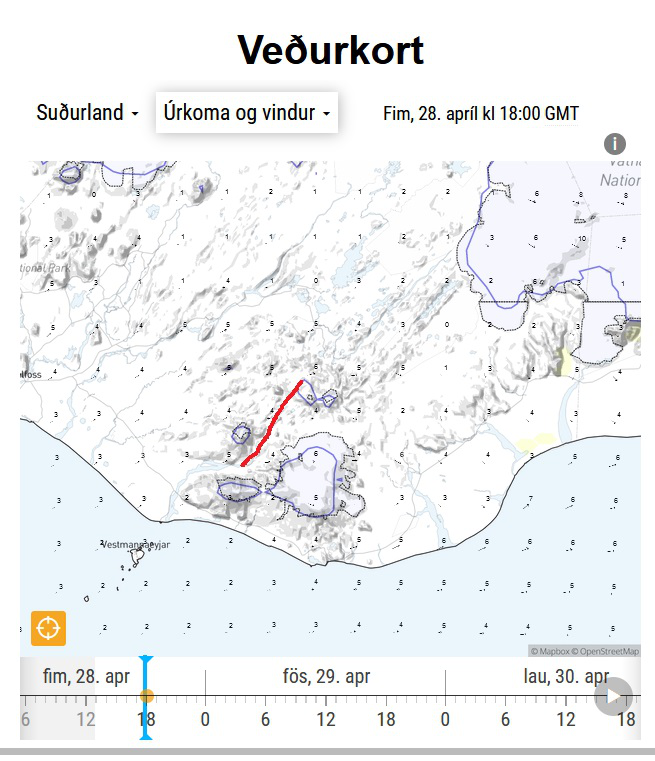 The red line on the example below shows the approximate position of the Laugavegur. 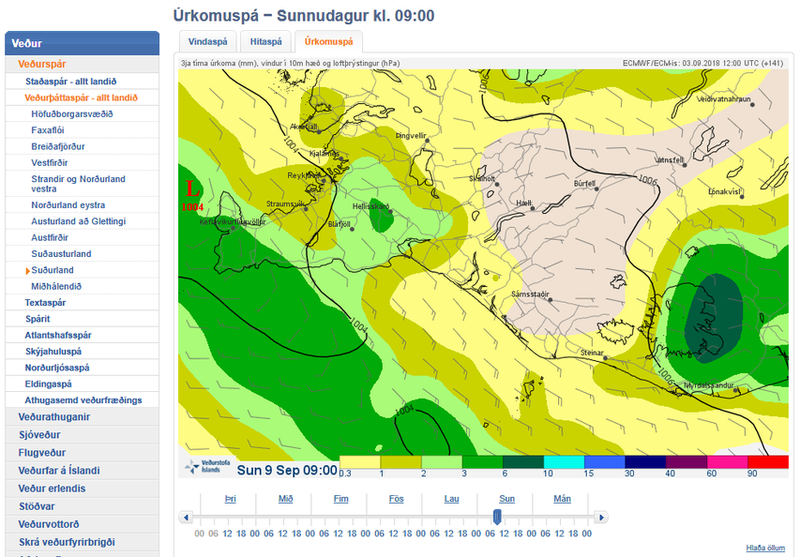 I have written more about Laugavegur conditions at different times of year in my last article. A freak hail storm hits Landmannalaugar in August.